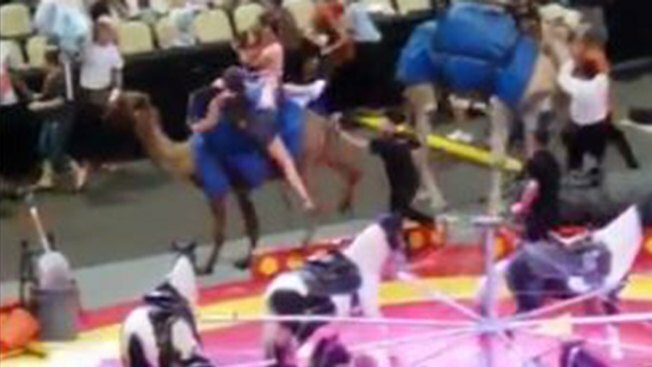 A scared camel injured seven people at a Pittsburgh, Pennsylvania, circus on Sunday. Those injured are expected to be OK and the camel was brought under control in a few minutes. UPDATE: The USDA, which enforces the Animal Welfare Act, is looking into the incident. A startled camel started bucking during a circus when a child apparently threw a shovel at its feet, injuring six children and an adult and causing frightened circusgoers to flee the arena. Two children and an adult were riding the camel during an intermission at the Shrine Circus at PPG Paints Arena when it became startled. Authorities say one child suffered a broken arm, while the injuries suffered by the others were considered minor. The incident, caught on video , happened around 3:30 p.m. as people were buying rides on tethered camels, ponies or elephants led by handlers. Ruthie Kester, a Latrobe resident who was at the circus, told KDKA-TV in Pittsburgh that a child threw a shovel — used to clean up after the animals — at the camel's feet. "They were giving camel rides and camels were walking around calmly. And then a kid threw a shovel at the camel's feet, which startled the camel and it started to buck," Kester said. Seven people, most of them children, were injured when a startled camel started bucking during a Pittsburgh circus. She said the bigger girl fell first. The camel was brought under control within seconds, and the circus resumed without any further problems. The animal was not injured, officials said. It was the event’s third and final day. Authorities are seeking to verify that the shovel caused the animal’s reaction, and police are reviewing video of the ordeal to determine the cause.